In the treatment of heroin addiction, using methadone remains a controversial approach. Criticisms and concerns about its use are countered by its effectiveness, especially in the face of a problem as serious as heroin addiction, when much of the country is gripped by a rise in opioid-related overdoses and deaths. 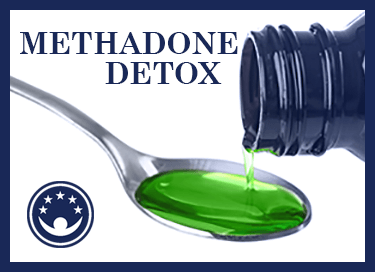 Methadone as a short-term detox drug is still the method of choice by many treatment centers but with a number of caveats attached. The painkilling element makes methadone a popular medication of choice in the treatment of chronic pain, but the other characteristics are important when methadone is used as a detox drug for heroin. Heroin withdrawal causes many negative effects that methadone, as an opioid, counters; for example, the sedative property of methadone will help those who are experiencing anxiety and depression as a result of their withdrawal. Similarly, reducing bowel activity could work against the diarrhea that is a typical withdrawal symptom, and the low blood pressure that arises from methadone use will assist with balancing the high blood pressure that comes with heroin withdrawal. A risk of using methadone as a detox drug, and what has made its use so controversial, is that some users can develop tolerance to and dependence on the drug if they are repeatedly exposed to it. Trying to get off methadone after becoming dependent on it can lead to its own withdrawal symptoms, such as vomiting, chills, fever, runny nose, crying, rapid heart rate, and other physical effects. For this reason, methadone is best prescribed for the short-term – long enough to help the person get over the hardest parts of withdrawing from heroin (since methadone is a long-acting opioid), but not so long as to create an unhealthy need for the relief or pleasure methadone can provide. With this in mind, the goal of using methadone as a temporary detox drug is maintenance therapy. Clients who are physically and psychologically dependent on short-acting opiates receive methadone as a substitute for the other drug to which they are addicted. In the case of heroin, methadone is not only legal, it is also considerably less dangerous, although care should be taken when consuming opioids of any kind, especially among those who have demonstrated a susceptibility to addiction. Practiced in the short-term, methadone maintenance therapy minimizes, or outright blocks, the worst of heroin’s withdrawal symptoms, as well as dulls the euphoric effect of a heroin hit and clamps down on cravings for heroin. As a result, this approach offers clients a supervised break from the constant need to get and use heroin, and provides a path for eventual reintegration into normal life. Research has found that methadone maintenance reduces illegal heroin use, and using methadone as a temporary detox drug also markedly decreases the spread of infectious diseases, like HIV and hepatitis, that are transmitted through the use of shared needles. Such programs also reduce criminal activity (“crime during methadone treatment is substantially lower than during street addiction,” found the Journal of Substance Abuse), improve social outcomes and bonding among family members, and even decrease mortality among patients. In a methadone-based treatment program, doctors will administer small doses of methadone hydrochloride to heroin-dependent clients, with the idea of heading off the withdrawal symptoms of getting off heroin, and then gradually reduce the methadone doses until the client is completely free of the drug. Treatment doses normally begin around 10-20 mg and are increased by increments of 10 mg until the heroin withdrawal symptoms are under control. Doctors will typically prescribe a dose on the lower end of the spectrum to ensure that the introduction of another opioid to the client’s system will not cause irreversible harm. When the client adjusts to the dose, the incremental changes can begin. The Center for Substance Abuse Research explains that the precise amount of the dose will also be based on individual client specifics, such as body weight, age, medical history, and mental health, all of which are evaluated and taken into consideration before treatment itself begins. The methadone itself is administered in liquid form, and its consumption will be supervised by a pharmacist, doctor, or other healthcare professional. This is done to ensure that the client takes exactly the prescribed amount of methadone, to make the weaning and withdrawal process as smooth as possible, especially given the time constraints of temporary maintenance therapy. Even in the context of using methadone as a short-term detox drug, the doses have to be taken regularly. Going off schedule means the body may lose the ability to properly process the methadone hydrochloride, increasing tolerance for the drug and requiring that the client start the replacement therapy from the beginning. It can take anywhere between two and four hours for methadone to hit its peak effect. The drug accumulates in the body, so clients will usually feel a stronger effect of the drug over the period of a few days even if there is no corresponding increase of the dose. Since the methadone administration is intended to replace heroin consumption, clients may experience partial withdrawal symptoms even though they are still getting opioids because the optimal dose has not yet been determined. Each client has an individual ideal dose (based on how much heroin was being taken and how the body processes the methadone), which may not be reached except through trial and error (while still endeavoring to cause as minimal discomfort as possible). For most people, a daily dosage of 40 mg a day controls withdrawal symptoms but does not eliminate the desperate craving for more heroin. When a supervising doctor establishes the required dose to eliminate withdrawal symptoms, the client is put on this dose for 2-3 days, after which the dose is slowly reduced every day or every other day. The standard reduction is 10-20 percent, but individual client responses and physiology must be taken into account. In the event that the reduction rate is too much, and clients experience withdrawal symptoms (or doctors fear that there is a chance of relapsing back into heroin abuse), the supervising practitioner should either increase the dose, slow the tapering process, or both. Withdrawal symptoms might not present themselves for up to three days following the last dose of methadone. Close monitoring of clients should determine whether these effects are the result of withdrawing from heroin or the methadone, and doses can be adjusted accordingly. Since there is a risk of clients becoming dependent on the methadone (even in a short-term detox setting), it is important that the presiding doctor know as much as possible about the potential physical and psychological responses of a client to methadone. To that effect, clients should disclose their entire medical and family history before treatment begins, as well as a full list of all drugs that have been consumed and any diagnosed mental health disorders (and undiagnosed symptoms) that might have precipitated the heroin abuse. With all this information, the doctor can make a good estimate at the best methadone dosage for the client while minimizing the risk of dependence and withdrawal. Methadone side effects are normal and expected, but a client receiving treatment may nonetheless be alarmed and distressed when they arise. Counseling and support from medical staff should ease the process and ensure that cravings for heroin or more methadone to alleviate the discomfort are kept in check. In clients who have long-term and serious addictions to heroin, there can sometimes be a likelihood that they will go back to their heroin abuse even after methadone detox is complete. For this reason (and, indeed, for any degree of heroin addiction), methadone replacement therapy alone is insufficient, especially if the therapy is administered for a relatively short duration. Clients have a much greater chance of staying off heroin in the long-term if they receive counseling from a therapist and support from friends, family, and a peer group. Those receiving methadone in a professional rehabilitation setting will receive counseling concurrently with methadone administration. As a result, the U.S. Drug Enforcement Administration considers methadone dangerous enough to place on its list of Schedule II drugs; it can cause severe physical and psychological dependence, but it has enough of a legitimate medical application to keep it off the Schedule I list, which would make it completely illegal in any context. As a Schedule II substance, its use and distribution are tightly controlled, limiting its access to hospitals and treatment centers, which is why its use as a detox drug is favored for short-term maintenance therapy.